Thanks Lloyd! You're like a lightning bolt! Which kind do i need for the above games? anyPin DMD+ will work in all of the games you list. The others will too, except the 5101 only, but the anyPin DMD+ is of course the least expensive. Anyone have bulk deals on say 20-25 units of the 5101 for the early Bally solid-state pins? 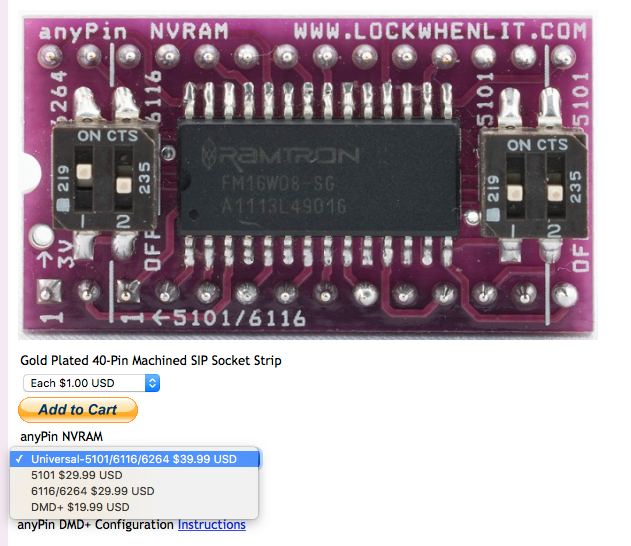 If you get quoted for nvram for much less than $10ea in a 10-pack, take the deal and run!! With cost of materials, Paypal fees, assembly labor and tax hit -- there's thin profits at that pricing. Not likely to find cheaper unless someone's really bad at math or doesn't value their time at all. I've got 10-packs for 5101s available at links already mentioned earlier in this thread, but can't price them quite as cheap as weebly because of the ultra-compact design and longer assembly time that requires. They're a measly $1-2 extra per module for a different style design that IMO looks great when installed & stores easier due to the smaller size. Some people will care, some people won't & that's okay with me. Just another choice offered Good luck! I've had no issues buying used 1608 NVRAM from AliExpress. $1.35 per chip and I may have had 2 ever that either didn't work or had a broken leg. Is there a nice "how to install NVRAM" guide or video out there? I've thought of replacing batteries with NVRAM, but I want to know what I would be getting myself into before purchasing anything. I've come a long way in my soldering skills, but still pretty skittish when it comes to working on boards. FM1608 will replace 6264 but not the other types of RAM. Typically what's being sold are used parts with unknown history that had their surfaces sanded down and resurfaced (blacktopped) and stamped with new part numbers. That said, can't really beat the price. Some things to keep in mind -- they often ship the DIP chips with zero anti-static protection, in plastic wrap or chips stacked with rubber bands around them and tossed into an envelope that's not very padded. You may have some straightening of legs to do when they arrive. There are a lot of sellers on Ali, some are good, some are bad. Most will deliver parts to you, just a matter of how they arrive & how many rejects you might get. You'll help your odds by using sellers other people have had good luck with. An install video wouldn't be very exciting for the plug-and-play varieties. Pop the old RAM out, insert the nvram making sure you get orientation of pin #1 correct (or you'll short the chip immediately on power-up). Then reset settings / Factory Reset option on newer games. Takes a few minutes is all. For the nvram that requires desoldering.. any video showing any larger pin-count IC being removed should be helpful. I typically snip all the legs with micro shear cutters, pull the pins individually and then desolder the holes. Some people have great luck removing the entire chip with a Hakko 808 / FR-300. I tend to not care about wasting a $0.50 SRAM chip to make sure one leg isn't clinging in a through-hole and ripping a pad or trace. Heavy caution should be executed on WPC boards as the traces are very thin where they go into the pads. My opinion if you're skittish.. better to send the boards out until you've worked on enough other boards. If you aren't comfortable tackling $200-300 boards like WPC and Sys11's, don't do it! If you go in thinking you might mess something up, you likely will. Chris Hibler and several others do mail-in installs of NVRAM. Costs are pretty reasonable and nvram chip itself is included in the price.